"Johnny Hockey" is following in the footsteps of "Johnny Football" -- right into Canadian and U.S. patent and trademark offices. After NFL quarterback Johnny Manziel turned heads while winning the Heisman Trophy and made headlines by trademarking the term "Johnny Football" while starring at at Texas A&M, the NHL's Johnny Gaudreau is following suit during his own breakout rookie season with the NHL's Calgary Flames. TSN has learned that Gaudreau, winner of the Hobey Baker Award as U.S. college hockey's best player last year, has trademarked the term "Johnny Hockey" with patent and trademark offices in both Canada and the U.S.
Like Manziel, Gaudreau wants to slap his name on sports equipment and apparel, not to mention athletic shirts, sleepwear, athletic tops, shorts, skirts and gloves. Gaudreau's application is pending in both countries. "We were concerned that people were going to abuse the Johnny Hockey name, coming out with Johnny Hockey shirts and stuff and we wanted to make sure that did not occur," Lewis Gross, Gaudreau's agent, told TSN. "We felt that Johnny was going to be a special player and if he takes off the way we felt he could, he has the potential to have endorsement opportunities that could be very valuable." Gross, who filed the trademark application on Gaudreau's behalf, said his colleagues have confirmed that no one had filed for the "Johnny Hockey" trademark. Gross wouldn't say how much the trademark would cost. 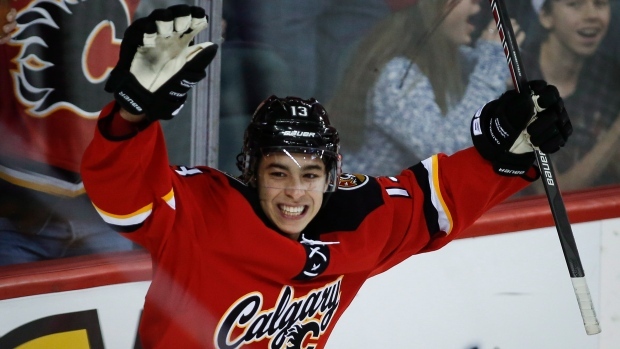 Gaudreau, 21, who is listed at 5-foot-9 but has been previously described by teammates as being 5-foot-6, has scored 13 goals and added 19 assists in 42 games with Calgary this season. "We've had quite a bit of discussion about what he might do endorsement-wise and we're trying to narrow things down," Gross said. "He's still just a rookie and want him to focus on playing. He signed with Bauer and we've also done a deal with Pizza Pizza in Calgary and has an auto deal as well. We're looking at other possibilities. Johnny Hockey is just a name to us. When you watch Johnny play, there's something unique and special. All you hear about is his size but he does things on the ice so electrifying." Gross said he couldn't confirm Gaudreau's actual height. "I haven't specifically measured him," Gross said, chuckling.